Phialosimplex caninus, a new genus and species, was described for several isolates of fungi associated with infections in canines. Sagenomella chlamydospora, previously reported as the cause of disseminated infection in a dog, was shown to be a related species. The genus Phialosimplex is another member of the ascomycete family Trichocomaceae which includes many opportunistic pathogens belonging to the genera Aspergillus, Penicillium and Paecilomyces. Two cases of P. caninus infection in dogs were described in 2012-2013. The first case involved bone marrow infection in an immunocompromised Cocker Spaniel. The second case involved a 7 yr old otherwise healthy Miniature Poodle cross dog from the Toronto area who presented with enlarged lymph nodes and spleen. In both cases, long-term therapy with itraconazole failed to eradicate the infection. Onychocola canadensis, first described by us in 1990, is now recorded worldwide as an uncommon cause of nail or rarely skin disease. The infection occurs primarily in older individuals and often affects the big toenail. Infections are not easily cured. Infections caused by O. canadensis are recorded from patients in North America, UK, Europe, Australia and NZ. In mating studies among isolates of O. canadensis, we obtained structures typical of Arachnomyces, an obscure genus infrequently encountered on decaying grasses and of uncertain disposition within the ascomycetes. Phylogenetic analysis by C. Gibas (Ph.D. 2005) revealed that Arachnomyces belongs to a new lineage of the ascomycetes (Arachnomyces kanei, for isolates obtained from abnormal toenails of patients in a large Canadian study. Another species, Arachnomyces glareosus (anamorph Onychocola glareosa) also has an association with nails. Sean Abbott’s (Ph.D 2000) study on biodiversity and systematics of the Microascaceae led to the discovery of a Microascus teleomorph for the common mold Scopulariopsis brevicaulis (first described in 1881). This was significant for placing the type species of Scopulariopsis within this ascomycete family. Sexual incompatibility systems were largely unexplored, and Abbott’s work was the first to demonstrate heterothallism and Microascus teleomorphs for Scopulariopsis candida (synonyms Scopulariopsis koningii) and Scopulariopsis asperula (synonyms S. arnoldii, S. bestae, S. fusca, and S. roseola). Sexual compatibility systems were also used to demonstrate homothallism in Microascus nidicola and heterothallism in the new species Microascus soppii. Emmonsia species are well represented in UAMH and many isolates date from animal surveys and taxonomic work done between 1940-60 by two predecessors. In 1996, we described Ajellomyces crescens, teleomorph of Emmonsia crescens, providing the first direct evidence of relationship between Emmonsia species and the systemic pathogens Blastomyces and Histoplasma. 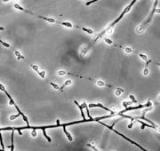 DNA sequence analysis confirmed a close relationship with Blastomyces as suggested by morphology, revealed several genetic entities within Emmonsia and provided insights into the ecology and distribution of Emmonsia species. 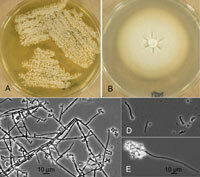 Emmonsia species, together with Blastomyces dermatitidis, Histoplasma capsulatum and Paracoccidioides brasiliensis, belong to a distinct lineage of the ascomycetes, the Ajellomycetaceae. Recently Emmonsia-like fungi having clinical similarities to Blastomyces and Histoplasma have emerged as causes of systemic human mycoses worldwide. Adiaspores of Emmonsia crescens produced in culture. Emmonsia parva and E. crescens are soil fungi that occasionally cause adiaspiromycosis, a pulmonary disease primarily of small rodents and other burrowing animals. The tissue spore form consists of a large, globose, thick-walled, non-proliferating structure called an adia­spore. Human infections are rare, usually presenting as a diffuse pulmonary infection, and often diagnosed from histopathology. Comprehensive coverage of adiaspiromycosis caused by Emmonsia species is provided in a book chapter in Topley and Wilson's Microbiology and Microbial Infections (9th and 10th edition).